If you're all about functionality dressing when it comes to your personal style, you'll love this simple pairing of a Closed striped crew neck t shirt and blue jeans. Rocking a pair of charcoal plimsolls is a simple way to add some flair to your ensemble. 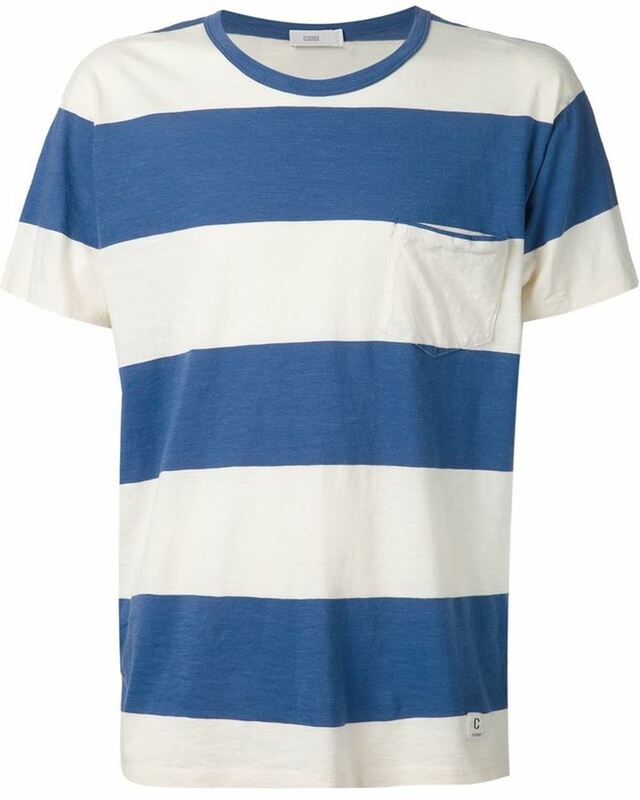 If you're all about comfort dressing when it comes to your personal style, you'll love this stylish pairing of a Closed striped crew neck t shirt from farfetch.com and navy jeans. 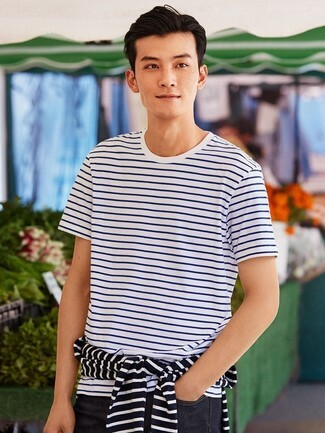 Pair a white and blue horizontal striped crew-neck t-shirt with charcoal shorts if you're in search of an outfit idea for when you want to look casually cool. Round off with white low top sneakers and off you go looking savvy. If you're on the lookout for a casual yet seriously stylish outfit, wear a Closed striped crew neck t shirt with navy chinos. Both items are totally comfortable and will look great paired together. 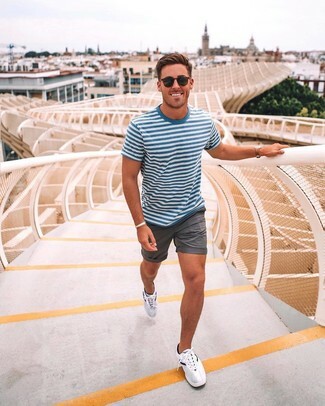 If you're on the hunt for a relaxed casual and at the same time dapper look, go for a Closed white and blue horizontal striped crew-neck t-shirt and grey shorts. Bring a more relaxed feel to with white athletic shoes. If you're in search of a casual yet sharp getup, marry a Closed striped crew neck t shirt with khaki chinos. Both items are totally comfortable and will look great together. When it comes to footwear, this getup is round off brilliantly with white low top sneakers. If you're scouting for a casual yet dapper ensemble, go for a Closed striped crew neck t shirt and pink chinos. Both items are totally comfortable and will look great together. When it comes to footwear, this getup pairs nicely with blue low top sneakers. 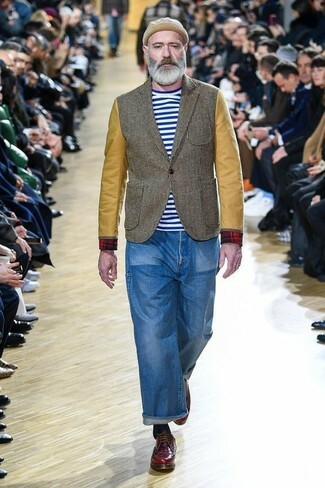 We're all getuping for comfort when it comes to dressing up, and this combination of a Closed striped crew neck t shirt and blue jeans is an amazing example of that. And if you want to instantly kick up the style of your look with one piece, enter burgundy leather derby shoes into the equation.